Since 1981, Australian-owned and operated Auscold Logistics has earned a reputation for providing genuine, personalised service and customised solutions to the complex supply chain needs of our local and interstate customers. We take 'a fresh approach' to every aspect of our business to provide safe, reliable and cost-effective transport and warehousing solutions. To learn more about Auscold and our services, please browse through our website, or contact us to discuss your specific needs. A new website rolls off the line. 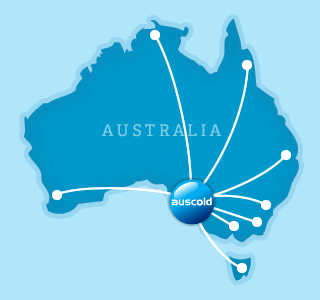 Sign up for our newsletter to receive news about Auscold and the logistics industry. Auscold Logistics’ is a very professional, determined and customer focused company that always go beyond our expectations. Product quality and temperature control is critical to our business and we know we can rely on Auscold to deliver on time and within our specifications. The level of customer service is exceptional – nothing is too much trouble for them." Auscold Logistics’ dedication to their customers is fantastic. They are easy people to deal with and nothing is ever too much trouble for them. As all of our products are either Frozen or Fresh, and many stored off premise, we need companies that understand Cold Chain Logistics, have good equipment, and understand our business. We found this approximately 8 years ago with Auscold Logistics. At first, I was wary to change from our existing Cold Store, but now that I look back I wish I made the move earlier. We’ve found their service levels exceptional, the people excellent to deal with, and prices competitive. I would recommend Auscold to any company looking for these benefits. "Through the effective management of the total receipt, storage, picking and distribution processes, the team at Auscold providen a high level of control over our inventory and well managed solutions that address the increasingly complex logistical needs of all of our restaurants in South Australia."